A Virtual Office contains a combination of services; Business Address, Telephone Service, and Meeting Room. It provides you with a combination of services that provide a professional business image at an affordable price. The landscape of small business changes as technology enables us to be more mobile. Business owners are no longer tied to an office 8 hours a day. A traditional “office” is no longer required in some cases. However, being home based or mobile does not mean sacrificing a professional image. If you are utilizing a Virtual Office Business Address, or not, you may find the need to meet with your clients face to face. Instead of meeting at the local coffee shop, reserve one of our professional, private meeting rooms. These on-demand spaces are available for hourly or daily reservations. Day Office – This space is perfect for a one on one meeting or a quite place to do work. This office is professionally decorated with an executive desk and leather wing back chairs for your guests. Free Wi-fi is available during your reservation. 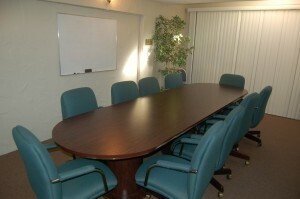 Conference Room – These are traditional style conference rooms that will seat 8-10 people. Equipped with Wi-fi, dry erase boards, telephone, and a flat screen for presentations (see on-line calendar for room specifics). Training Room– This substantial room can accommodate up to 50 people. Perfect for a training, sales presentation, or large event. Set up includes tables and chairs (2 people per table), free Wi-fi, and dry erase board. Projector and projector screen are available for rent. When a client visits the location, they are greeted by a friendly receptionist in our shared lobby. Their arrival is announced and we will direct them to your reserved space or you can greet them personally in the lobby. Visitor notification leads us into the next Virtual Office Service of Telephone Service. We will discuss this in our next post. You can reserve an on-demand meeting room 24/7 using our online reservation system at Meeting Room Reservations.